We love our Bioshock cosplayers so much we hired one, Irrational Games proclaims. Anna Moleva, aka Ormeli, is the official face of Bioshock: Infinite's Elizabeth, and will be helping Irrational Games with its promotional materials and television adverts. The talented Moleva will also be appearing as Irrational's guest at select events, in the run-up to Bioshock: Infinite's release next year. Moleva had some difficulty getting her heroine's look just right. "The thing is," says Moleva, "that I first saw Liz as she appeared initially: a different hairdo, a different costume." Work started, but then Irrational changed Liz's appearance. Not a problem, thought Moleva; this can be fixed, and so she began afresh. Then Irrational changed Liz's look a second time. "I remember pacing around my apartment, furious," Moleva said. "'Dear developers! How can one cosplay a character whose appearance is constantly changing?!'" Not that these setbacks stopped her. "When Liz's appearance was finalized," Moleva said, "and I saw what I think is a remarkable resemblance between us, I as a cosplayer couldn't just ignore it." Naturally at the moment she can't put more than a face to Elizabeth, since nobody really knows what the character will be like. However if you want to know what Moleva looks like, just sneak a peek at the back of the box; Irrational already has her face out there, and there will be more to come. 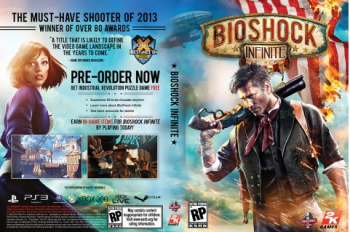 Bioshock: Infinite is due out for PC, PS3 and Xbox 360 in February 2013.